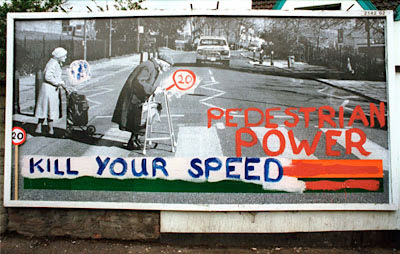 Elderly residents of a Bristol suburb helped activists to deface an “offensive” poster for the Internet bookmaker PaddyPower.co.uk that they claim makes them a target for dangerous drivers. A dozen pensioners and road safety campaigners set out with stepladders and green paint and defaced the poster. They pasted 20mph speed restriction signs over the betting odds and the word PaddyPower was replaced by PedestrianPower. Yeah - right on!